… without words. Let your play do all the talking. Practice hard. Play hard and leave it all on the court. All that’s required of you at this very moment is PASSION. What type of basketball player are you? What type of player do you want to become? What do you hope to accomplish through basketball training? Answer these three questions and you’ll be on your way. Remember, the skills, the style, and the manner in which you play, is a reflection and expression of who you are. Everyone loves scoring. Offense is fun; it gets people excited. But there’s more to basketball than just making shots. You can score all the points in the world, but if you can’t stop anybody from scoring, what’s the point? So, what separates the average/mediocre player from the outstanding player? EFFORT. Bet you didn’t expect that one! For example, playing good defense is usually a result of a good consistent EFFORT. If you did nothing else in the game, but played solid defense on your opponent, you HELPED your team. 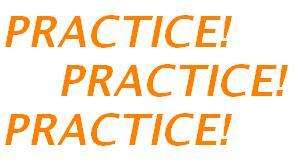 Great players are skilled as a result of PRACTICE. And guess what? Practicing hard is an offspring of a solid effort. There isn’t a magic trick or formula, just good ‘ole hard work. So take basketball training and add the effort through practice. Wait, there's more. If you practice each and every day riding a bike with your head down, you’re in for a world of pain. Practice is only effective if it’s done the right way, with proper TECHNIQUE. One of my favorite quotes from Michael Jordan. Practicing hard and practicing right in basketball training is as important as putting your pants on one leg at a time. Okay that was corny, but you get the idea. Let’s get started… Welcome to the Basketball Training Grounds.